When you start a new business, one of your primary goals is to keep all costs down. That usually means starting small when you need to move into an office. All entrepreneurs dream of having large, spacious office environments. But, the truth is most startups cannot afford such luxuries. As a result, they end up with offices that are somewhat “cozy”! The trouble with small office spaces is they can sometimes stifle creativity. And that’s not a good thing when you’re trying to make a name for yourself! The good news is you can easily make your small startup office space more creative than it is. How? By trying out the following recommendations, of course! Add some vibrant color accents. Most offices will have white walls and ceilings. They might even have neutral colored carpets like beige or gray. As you can imagine, such neutral accents don’t do much to promote creativity! Did you know that with a few simple color changes, you can make your office space more vibrant? For instance, you could remove the drywall on a large section of wall and expose the brickwork. Doing so creates an impressive feature wall and a new focal point in your office. You could also paint your heaters and HVAC units bright colors like red or blue. Another option is to have plain desks with chairs that boast vibrant tones! It’s likely that you and your staff will be working at desks most of the time at your office. In a small room, desks can often take up a lot of floor space. That leaves little room for maneuverability! One thing you could do is give each person an adjustable height desk. Why? Well, they could raise their desks and work on their feet when space is at a premium. Or if they want to quit sitting down for a while. Plus, when desks get raised, it’s easy to store chairs underneath them. It’s likely your business will amass equipment and “things” that won’t get used regularly. 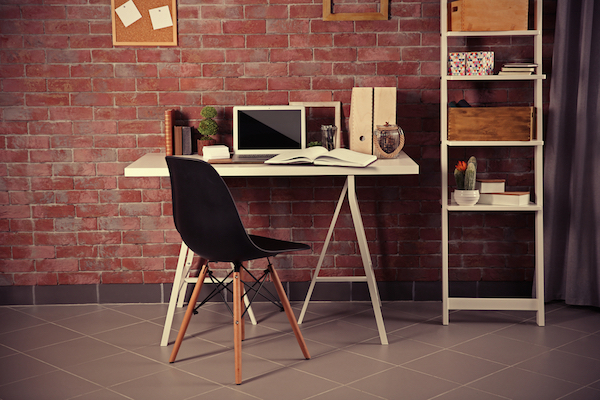 Instead of stacking those items in your small office space, why not store them off-site. Some companies will collect and store your items in storage facilities. When you need them, you can have those firms deliver them back to your office. Sure, you will end up having less stuff in your office. But, the fact there are fewer items there will make the environment feel more creative. Make your office look more natural. Plants are the kinds of things you will see in your home and garden. So why aren’t they found in offices? There is research to prove that office plants can help people be more creative and productive at work. They also make your office look more appealing to staff and visitors alike. Create a designated chill-out zone. Last, but not least, people sometimes need a break to get those creative juices flowing. One thing you could do is create a “chill-out zone” in your office. It could be a dedicated room or just a small corner of your office. The aim is to create a comfortable and work-free zone for your staff. People can sit down and read a book, play video games or even relax there.